Ultra deluxe Montana Home with pond for sale. This spectacular 5 br/4 bath cedar arts and crafts home is nestled on a rare 31.25 acre parcel. Large master suite has views of Georgetown Lake and the ultra deluxe master bath has a tiled multi-head shower, instant on sauna, two-person jetted spa tub and double sinks. Lounge in the soaring great room featuring a two story stone fireplace and hewed hickory floors that lead out onto the 1200 square foot deck. The Gourmet Chefs kitchen is equipped with top of the line Thermador commercial appliances, mission cabinets; stained glass doors, and a large pantry. Granite counters throughout. Fenced grounds, pond, and pasture make this ideal for horses. Other structures include a 3 br/3bth 3 bonus room guest house/rental and a 32x36 heated garage/shop. Discovery Ski Mountain & Jack Nicklaus designed Old Works Golf Course are minutes away and some of the best fishing in the State on the Big Hole, Flint Creek, Rock Creek and Clark Fork Rivers are all within short drives. Agent owned. Ed has over 25 years of personal real estate experience and over 120 transactions that include raw land, recreational property, single family and vacation homes, syndication of single and multi family investment properties, office buildings, ranches and net leases. He brings strong market analysis skills and a carefully nurtured reputation for impeccable honesty and diligence. Ed is living his dream in the most beautiful place in the world, Georgetown Lake, Montana. 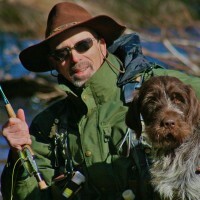 He suffers from various vices including fishing, hunting, skiing, 4 wheeling, canoeing, snowshoeing, and hiking. At present there is no cure.